According to the survey by Credit Research Foundation (CRF) and The Electronic Payments Association, B2B finance professionals anticipate that ACH transactions will pass checks as the leading form of B2B payments by 2020, as the digital transformation continues its inevitable expansion. ACH credit card processing is an optimal paradigm for any B2B company looking to accept check payments over the phone or set up recurring EFT debit transactions. With ACH solutions as part of an early digital transformation step, there’s effectively no need to deal with paper checks or reconcile accounts—these steps are electronic and automated. Reduced bank fees: In addition to the operational benefits of eliminating paper check handling, you’ll save money with decreased bank charges and fees for processing antiquated paper checks. Easy tracking of NSF and other activity: Tracking ACH and EFT transaction data gives you immediate notifications when a transaction is returned for insufficient funds (NSF). Smoother, faster operations: With ACH you’ll never have to photocopy a check, hunt for lost checks, store hard copy checks, or manually fill out handwritten deposit slips—the entire transaction is conveniently electronic and digital. EAP Integration: With regards to B2B ACH payments, these are also usually handled automatically by your EAP system. No Float: another major benefit is that with ACH, there is no float. In addition, sending an ACH payment usually costs $0.25 or less per transaction, depending on your ACH processor or partner. ACH payments require an initial setup with a company that processes ACH payments and a payment setup form for each client that wants to pay or be paid by ACH. Typically, the onboarding process is readily available online through a secure portal and is completed through a corporate enrollment process. Depending on the solution used for your EFT, maintenance of the vendor information must be performed by the service, or the partner might update their own information. 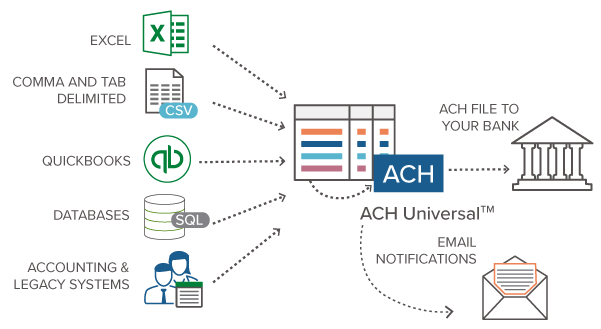 ACH transactions use end-to-end encryption, helping to ensure their safety and confidentiality. Money transferred electronically passes through fewer hands than a physical paper check which helps statistically with security. Also, government rules and regulation provide consumers with protection regarding electronic payments. For most B2B companies, paper checks are an inconvenient part of doing business. The multi-step process of check acceptance to funds receipt is a long and complex method for performing what is in reality a singular, easy transaction—and many of these steps are unnecessary in today’s electronic Straight-Through-Processing world. With Business to Business ACH Processing you can streamline your paper check process and get your funds faster. An automatic recurring debit program using Automated Clearing House (ACH) and Electronic Funds Transfer (EFT) solutions deliver the convenience of recurring transactions without the need to use paper checks, complex account reconciliation, or multiple trips to the bank. But again, ACH is the first step in a digital transformation process. For example, going the extra step to bring payments and remittance together, and every other positive solution in the Order-to-cash process. Globys can help you navigate every issue with your unique transformation, so you have an optimized straight-through-processing structure created the way you do business.To learn more about what Globys does, please view the video on the main www.Globys.com page.